About the Book: Sixteen-year-old physics nerd Aysel is obsessed with plotting her own death. With a mother who can barely look at her without wincing, classmates who whisper behind her back, and a father whose violent crime rocked her small town, Aysel is ready to turn her potential energy into nothingness. About the Author: Hi. I'm Jasmine. 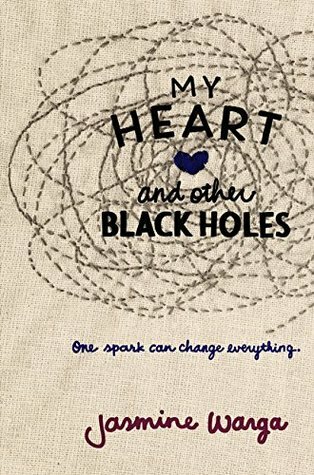 My first novel, My Heart and Other Black Holes, will be published in 2015 by Balzer + Bray/HarperCollins. I'm currently writing my second book which is tentatively scheduled to be published in 2016. I like emotive music, animals of all sorts, lemonade, and Swedish Fish. And books. Do I Recommend this book? Yes yes yes!! Notes and Opinions: I'm so in love with the cover!! I honestly didn't know what to expect from this book. At first I thought it might bore me but oh no. Far from it. I felt so connected to the characters. I feel so bad for Aysel and I just want to hug her. The message behind the story and how it's dealt with are done beautifully. Depression is a hard subject to talk about. I can promise you, you'll spend the whole book crying (a bit of laughing too). 10/10 would recommend!